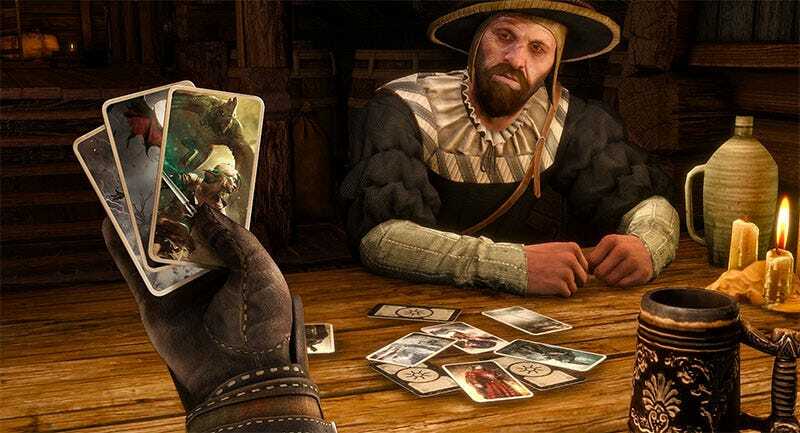 Hearts of Card is a mod for The Witcher 3. When active, it lets you walk up to an enemy, draw your sword and...the second someone takes damage, physical combat is replaced by an impromptu game of gwent against the opponent. While still fairly early in development, the mod already does a few key things, like scale the difficulty of the gwent deck to the level of the enemy you’re facing. Also note that you don’t need to play it over and over again in close quarters; the one victory here wipes out all nearby enemies as well. And if you lose? You die. So don’t lose. Stuff coming in the future will be special drops from beating bosses and modifying the game’s coin economy to put more emphasis on cards (so you’d see more cards in shops, etc).